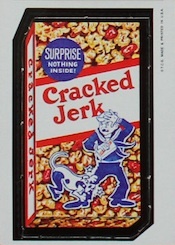 The original Wacky Packages did not enjoy the same early success as many of the subsequent releases, despite sharing the same basic concept. However, over time, the release has become very valuable due to the significance of being the very first Wacky Packages. 1967 Topps Wacky Packages sticker cards were released in both 1967 and 1968. The playful cards parody popular household items in clever, and sometimes gross, ways. The cards come in packs of five and also include a stick of gum. Although they are considered to be die-cut stickers, the cards were actually punch-outs, with gummed glue on the back, so the cards could be moistened and applied to surfaces like a stamp. This short-lived format was abandoned for the 1973 Topps Wacky Packages 1st Series, where Topps moved on to the peel-and-stick cards. More recently, Topps offered the original art for Band-Ache (#24) with an asking price of $1 million. Card #21 was replaced two times. 1967 Topps WACKY PACKAGES Die Cut #5 Chock Full of Nuts - PSA 6 Ex Mt - Scarce!! 1967 Topps Wacky Packages #1 Boredom's Coffee PSA 7 Tough First Card! 1967 Topps WACKY PACKAGES Die Cut #43 Maddie Boy - PSA 6, Ex NM - Rare!! Just wondering how many wacky packages chrome variation cards were made? Are some more rarer than others? Can anybody answer these questions? 1967 Topps Wacky Packs #37 CORONATION MILK PSA 8 NM MT Die-Cut Packages TOUGH! 1967 Topps Wacky Packs #17 WEAKIES PSA 8 NM MT Die-Cut Packages CENTERED!